Rev. Heng Sure ordained as a Buddhist monk in 1976. For the sake of world peace, he undertook a "three steps, one bow" pilgrimage from South Pasadena to Ukiah, traveling more than eight hundred miles, while observing a practice of total silence. Rev. Heng Sure obtained an M.A. in Oriental Languages from UC Berkeley and a Ph.D. at the Graduate Theological Union in Berkeley. He serves as the director of the Berkeley Buddhist Monastery and teaches on the staff at the Institute for World Religions. He is actively involved in interfaith dialogue and in the ongoing conversation between spirituality and technology. Three steps and a bow. That's how they walked it. Two monks on a pilgrimage of peace that took them through a series of wide-ranging encounters and extraordinary experiences -- within and without. In May of 1977 Heng Sure and Heng Ch'au started their unique journey from downtown L.A. to the City of Ten Thousand Buddhas in Talamage near Ukiah. A journey of more than 800 miles that took two years and nine months to complete. They bowed in peace, and for peace. Touching their foreheads to the ground, opening their hearts with one wish for the world. Peace. For everyone, everyday, everywhere. Three steps ... and a bow. More than 20 years later, they sit in a living room amidst a small gathering. And for the first time since that journey ended, they speak of it together, sharing the stories and the wisdom, the joys and the frustrations. What shines through is a compassion and humility beyond words. When Heng Sure begins speaking, he asks one question: "What brings us here tonight?" He answers it himself. “Curiosity from the heart,” he says. And he is right. All of us came with questions inside. Insistent internal questions -- But why? But how? Because what these two did is not easily or immediately comprehended by our minds. Heng Sure tells us it was their introduction to the Buddhadharma through practice. "Road- tested you might say," he twinkles. He talks of the pilgrimage having been a space where they could more closely follow how the microworld of the self influences the macroworld -- not only the one you encounter, but the world that extends beyond. On their travels they took no food with them, relying instead on the compassion of strangers in strange towns. It was a humbling exercise in dependence and vulnerability that led to a kind of trust and sensitivity. A heightened awareness of what you're putting out and what's coming back. He tells us a story then. Heng Sure is a wonderful storyteller -- warm, funny and self-deprecating. This was the story of Heng Sure the Sacred Monk out on the highway, bowing for world peace and ... thinking about chocolate cake and a can of Pepsi. It is the job of a meditator to watch his thoughts, and Heng Sure watched them through a cycle of greed, anger, stupidity and repentance. There was greed in his desire, anger in the can of Pepsi that came flying out a car window making straight for his head, stupidity in the broken glass in which it resulted, and repentance in his heart as he came closer to understanding how the choices we make determine the quality of life we encounter. "Was that a play written by the Universe for Heng Sure the Angry Monk?" he asks. "I don't know." But the story isn't about crime and punishment. It is about recognizing causes and their effects. It is -- to me -- about an awareness and attentiveness to one's thoughts and actions and how they come back to you. Marty would later say that the more peaceful they became inside the better people treated them. So that's what this black-belt and his companion walked forth with. "If you use these you will find them inexhaustible," their teacher said. And they were sorely tested on this. Again and again and again. People threw stones, punches, insults, threats. Walking through some of the toughest parts of town, they encountered dope-pushers, alcoholics, hardened street gangs -- troublemakers at large -- aching for an excuse, any excuse to fight. Looking down the barrel of a gun and meeting it with the Four Hearts, that takes a certain sort of strength, an integrity of spirit and unwavering conviction. That is what Heng Sure and Heng Ch'au took with them. They say that is what kept them alive. "When you're bowing, everything is in a different time," says Heng Sure. "Things look different. Things change. And for sure the Dharma comes alive when you need it." How else to explain the timely interventions, the woman who stepped out of a bar announcing that the drinks were on her just as a crowd of aggressive drunks were getting ready for some roughhousing, or the man who drove up to point out that the fennel being gathered for fennel tea wasn't fennel at all but hemlock -- and enough to drop a cow at that, or the Hells Angels waylaid in the nick of time by the teacher himself, who spent a couple of hours in the monastery and came out saying, "We promised the old fellow to take care of you, so not to worry." How to explain the children who gave them their lunches on their way to school, or the people who drove miles to give them a bag of groceries ... the stories go on, they are endless. They illustrate how remarkable, how very unique this pilgrimage was. But then Marty says something that brings you to a dead halt. "Sitting here, one of the things I felt was that none of you guys is any different from us. You wrestle with the same things." Taking that in can take your breath away. Because it's one thing to look at the two of them in wonder and awe of their journey and its motivations, but it's quite another to realize that your life and your road are not that separate from theirs. That yours, too, from this perspective, is a bowing pilgrimage. "There is no distinction between bowing on the highway and the lives we are leading now," he says. At the start of their journey they were told to be on the road as if they'd never left the monastery. When they returned they were told to be in the monastery as if they'd never left the road. Someone would later ask about renunciation, about spiritual desire, and whether that too had to be overcome. "Desire's a single flavor," says Marty. And Heng Sure recalls how early on his teacher would tell him repeatedly: "Forget the harvest. As much as you seek, that's how much you'll be obstructed. Don't seek Enlightenment. Just bow." Heng Sure tells us it is a gesture of grace, where you share the blessings all the goodness the merit you have within. You send it out to the world with a wish for wherever you see need for wholesome change -- specific, general, personal or universal. "The spirit of giving sends the gift, the prayer for well-being, throughout the world, to all creatures as far as our minds extend." On his guitar Heng Sure plays the tune to which the Dedication has been set. I am not sure what I am feeling, but it’s overwhelming. This is what they did; at the end of every day, these two, having walked long hours in their microworlds, they'd turn it back, dedicate it outwards, give it to the greater world. We, who were not part of that journey, listened to them; and listening, it became impossible to remain untouched, unmoved – not implicated. You realize that they walked for the people you meet on the streets, and the one's you've never seen and never will, they walked for people they knew and the one's they didn't. They walked for me -- and for you. And in that sense all of us were a part of their journey. There is a rush of bewildered gratitude and a stunned feeling that comes from trying to hold the enormity of what they did in your head and in your heart. 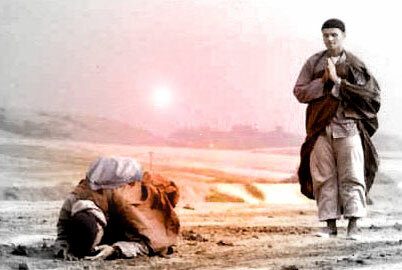 "There are many ways of bowing," Heng Ch'au has said. "You've got to be creative." We caught a glimpse of a deep and true wisdom tonight. And there seems to be only one thing left for us to do. 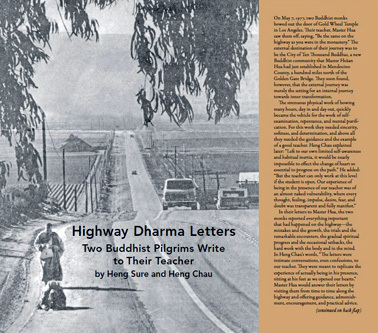 This collection of letters was written by two American Buddhist monks, Heng Sure and Heng Chau, during their two-and-a-half year pilgrimage for world peace along the California coast from 1977 to 1979. Bowing to the ground after very three steps, in the manner of early Buddhist pilgrims in China, they slowly made their way north, up the coast, from East Los Angeles, following Pacific Coast Highway through Santa Barbara and Big Sur to San Francisco, across the Golden Gate, then 100 miles further north on the Redwood Highay to Mendocino County and the newly established City of Ten Thousand Buddhas. Going at a pace of a mile a day, they bowed, studied, and wrote letters chronicling their experiences to their teacher, Tripitaka Master Hsuan Hua. Rev. Heng Sure is currently director of the Berkeley Buddhist Monastery and teachers on the staff at the Institute for World Religions. He received a Ph.D. from the Graduate Theological Union. He is a professor at Dharma Realm Buddhist University. Heng Chau, known as Martin Verhoeven, graduate with his Ph.D. from the University of Wisconsin-Madison. He is a professor at the Graduate Theological Union (GTU) and Dharma Realm Buddhist University. leaps out of the dust. are nurtured at all times. Great compassion can manifest when one realizes that the self nature is basically without any differences. It's all one and the same substance and he is part of it; it's in the self-nature that he connects with all that lives. This is where he does the work of taking all beings across, taking all thoughts back to their source. The Bodhisattva practices Great Compassion, and as he practices, his realization increases. There is no realization without practice, guided by vows. When he vows to take all living beings across, his vow is the beginning of compassion. When he sends all thoughts back to the self nature, that is actual practice. Why? Because living beings are thoughts and thoughts are living beings. Your own faults from failing constantly to take across living beings. Being lazy and not working diligently is a big fault; it is not the practice of the Bodhisattva. "At all times he nurtures them." He must do it constantly for Great Compassion to manifest. "At all times" in the Buddhist sense means from thought to thought, minute to minute, hour to hour, day to day, week to week, through months, years, life to life, kalpa to kalpa. Time loses its meaning. For the Bodhisattva who has vowed to save all living beings, one thought of purity, one act of Great Compassion extends throughout all time and space to the ends of the Dharma realm. What could be more liberated, more independent than the scope of Great Compassion? Practices are the measure of the Bodhisattva. In order to stay on the Middle Way he must maintain his Dharma-methods no matter what circumstances arise. If a good state appears he cannot turn from his practice. If an unpleasant scene develops, the Bodhisattva nurtures his practice all the same, taking tender care of his most valuable possession, the jewelled Dharma-raft that can ferry all beings from suffering to the other shore of bliss.